Background The M74 motorway extension, Glasgow, opened in June 2011. One justification for construction was an expectation that it would reduce road traffic accidents (RTAs) on local non-motorway roads. This study evaluated the impact of the extension on the number of RTAs, stratifying by accident severity. Methods Data for the period 1997–2014 were extracted from a UK database of reported RTAs involving a personal injury. RTA severity was defined by the level of injury: minor, severe or fatal. RTAs were assigned to (1) the local area surrounding the motorway extension, (2) a comparator area surrounding an existing motorway or (3) a control area elsewhere in the conurbation. Interrupted time-series regression with autoregressive integrated moving average (ARIMA) errors was used to determine longitudinal between-area differences in change in the number of RTAs, which might indicate an intervention effect. Results Glasgow and surrounding local authorities saw a 50.6% reduction in annual RTAs (n: 5901 to 2914) between 1997 and 2014. In the intervention area, the number of recorded RTAs decreased by 50.7% (n: 758 to 374), and that of fatal/severe RTAs by 57.4% (n: 129 to 55), with similar reductions in the comparator/control areas. The interrupted time-series analysis showed no significant between-area differences in temporal trends. The reduction of pedestrian casualties was attenuated in the intervention area relative to Glasgow and surrounding authorities. Conclusions Reduction in RTAs was not associated with the motorway extension. Our findings suggest that in planning future investment, it should not be taken for granted that new road infrastructure alone will reduce RTAs in local areas. Urbanisation is proceeding rapidly worldwide, and evidence of infrastructure changes is lacking; this novel study provides important findings for future developments. Road traffic accidents (RTAs) are a major public health concern; during 2014 alone, there were 1775 reported deaths on UK roads1 and 1.3 million worldwide (2010).2 More deprived areas have a higher incidence of traffic-related casualties.3 RTAs result from a combination of many factors, including the design of the road network, other environmental factors such as urbanicity,4 weather, vehicles, road users5 and how these all interact.6 The number and proportion of accidents are greatest on roads where traffic speeds are limited to 40 mph or less (72% of total casualties), whereas motorways—which in the UK contain 21% of all traffic—account for 5.4% of fatalities and 2.7% of casualties.1 These statistics suggest that motorways provide a safer infrastructure for traffic flow. Our study was a natural experiment, exploiting the construction of 5 miles of new motorway running through Glasgow, Scotland, which opened in June 2011. A new road was constructed mainly above existing roads and dwellings, not replacing an existing arterial road. There were changes to existing road layouts which led to new motorway junctions. The so-called M74 extension was built to relieve congestion on existing motorways in the city and was controversial: an independent report recommended against the proposal, advising that it would be likely to have very serious undesirable results for local communities.11 But the government at the time maintained that it would be beneficial by improving road safety and thus reducing RTAs in the local area.12 This provided a natural experimental opportunity to explore the arguments for and against the investment in new urban road infrastructure—arguments which, at the time, lacked a clear evidence base—and to contribute new evidence relevant to similar future proposals, particularly in countries going through the ‘motorisation transition’ in which new highways are more frequently constructed. The specific aims of this study were to evaluate the impact of the M74 motorway extension in terms of (1) changes in the number of RTAs during construction and following its opening, (2) differences in these outcomes by accident severity and (3) changes in the distribution of casualties between types of road user (pedestrian, driver, passenger or cyclist). This study is a component of a larger evaluation which includes assessment of impacts on active travel, community perceptions and social interaction.15 The overall study design entailed three study areas: the local area surrounding the new motorway in the South of the city (intervention area), an area surrounding an existing motorway (the M8) in the East of the city (comparator area) and an area without a motorway, surrounding a suburban railway line in the North of the city (control area). The three areas will be referred to as North, East and South hereafter.15 Each area was delineated to be broadly comparable in social, economic and demographic terms, using a 1000 m (0.6 mile) buffer around each of these linear transport structures. A wide buffer was chosen due to the M74 extension being a major new road in the South of the city which linked to other major roads in the West of Scotland and North England. We anticipated that people will travel substantial distances using the vast network of roads to gain access. RTAs were assigned to study areas based on the coordinates of each accident, and changes over time in the number of RTAs were compared between the three areas (figure 1). M74 study areas, Glasgow, UK. For this study, we also included a much larger reference area to provide an indicator of broader secular trends in RTAs. We chose the whole area covered by Glasgow City Council and its surrounding local authorities, partly because the intervention area spanned two local authority areas, and partly to provide a mixture of urban and rural areas and varied designs and densities of road networks for comparison. An interrupted time-series model was chosen for its ability to assess a series of data points over a continuous time period in order to detect changes in the secular trend at specified time points.21 Interrupted time-series regression models with autoregressive integrated moving average (ARIMA) errors were fitted to monthly count data to test the study hypotheses.22 ,23 Log transformations and differencing were applied to achieve time series that were normally distributed and stationary in level and variance. For time series in which some months had zero RTAs, such as those limited to serious and fatal accidents, the series were transformed using an inverse hyperbolic sine function.24 Individual models were fitted to each study area and data series. STATA/SE V.14.1 was used for the analysis. Autocorrelation functions (ACFs) and partial ACFs (PACFs) of each time-series model were used to identify seasonality and guide the initial model building. Detailed residual diagnostics were used to obtain a model with more accurate coefficient estimates. Outliers were identified following visual inspection of the initial models (p<0.05); dummy variables for these outliers were then included and the models rerun. The Akaike information criterion (AIC) was used as a mechanism to allow us to choose between competing ARIMA error models to broadly assess the fit of the model.25 The AIC was also used to assess whether removing outliers from the model improved the overall fit. Motorway construction began in June 2008 and continued until the opening of the motorway 3 years later. The full construction period was assessed for its impact on RTAs. During the construction period, local roads were closed and diverted, and this immediately and directly affected travel for drivers, pedestrians and cyclists. These abrupt changes to the local road networks may have increased RTAs as local residents travelled unfamiliar routes. This hypothesised impact was modelled as an abrupt and temporary (36 months) intervention effect lasting for the full duration of the construction phase. The M74 motorway extension opened on 28 June 2011. A ramp intervention effect was used to model any impact of the opening, which was assumed to be gradual and permanent.26 Although it could be assumed that the opening of the motorway on a specific date was an abrupt step event with the effect maintained thereafter, this pattern may not be applicable to new transport infrastructure. Changes in human behaviour, daily routines and other adjustments to new infrastructure often take months (or longer) to become fully embedded.27 The use of the motorway could therefore be expected to increase gradually following its opening and to be maintained thereafter. Sensitivity analyses were performed to explore the impact of different intervention classifications showing little differences in results. The most appropriate ‘intervention’ classification for interrupted ARIMA time-series models can be guided using the AIC criterion or based on the anticipated impact of an intervention,28 as in this case. We also modelled the series using different intervention classifications (step, ramp or ramp-and-step) to reflect alternative ways of theorising the impact of motorway opening as ‘abrupt permanent’, ‘ongoing gradual’ or both ‘gradual’ for a short period (3 months) and then ‘permanent’. These alternative specifications made no material difference to the overall results or goodness of fit of the models. Changes in the number of casualties (pedestrian, driver or rider and passenger) were too small for time-series models. Therefore, changes in the proportion of pooled casualty numbers by road user and study area are reported for serious and fatal casualties. Changes in proportions of casualty number by study areas were measured using analysis of variance (ANOVA) and, if significant, pairwise comparisons were contrasted between individual study areas. All study areas experienced a reduction in the annual number of RTAs for all accidents during the period 1997–2014 (figure 2): Glasgow and surrounding authorities experienced a 50.6% reduction (from 5901 to 2914), with reductions of 50.7% in the South (from 758 to 374), 49.3% in the East (from 292 to 148) and 50.5% in the North (from 315 to 156). When analysis was limited to serious or fatal accidents, there were greater proportional decreases across all areas (see online supplementary table S1). Monthly trends in RTAs (all accidents) by study area, 1997–2014. RTAs, road traffic accidents. Annual number of RTAs by severity and study area, 1997 to 2014. There was large variation in the total monthly accident count within each study area, but an overall downward trend across all areas. The decline was more apparent in the South (intervention) area, than in the East and North study areas. Table 1 shows the results of the time-series models. The column ‘estimate’ provides the monthly change in the number of RTAs; a negative number indicating a month-by-month reduction in the number of RTAs for that area and size of that reduction. Interrupted time-series regression found a significant decrease in the total number of RTAs during the period 1997–2014, both in Glasgow and surrounding authorities as a whole (−0.042, 95% CI −0.054 to −0.030) and in the South (−0.41, 95% CI −0.069 to −0.014), East (−0.05, 95% CI −0.083 to −0.022) and North study areas (−0.054, 95% CI −0.088 to −0.019; table 1a). 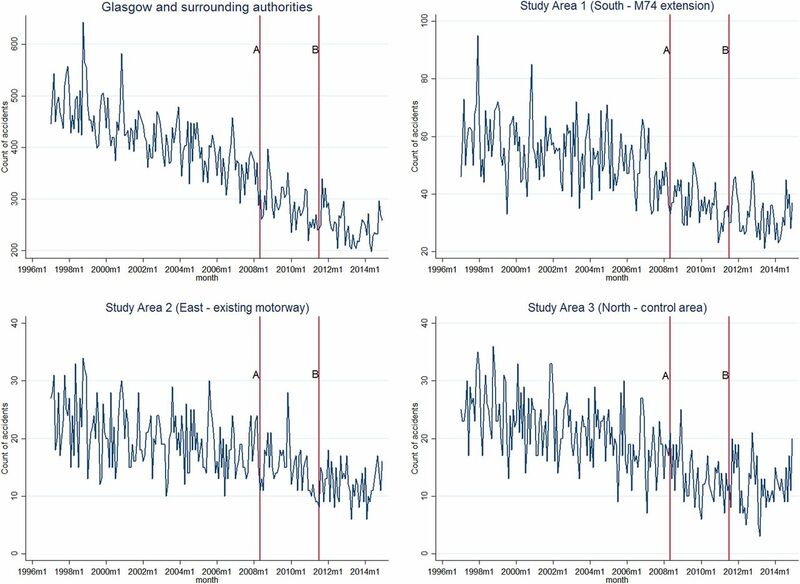 Evidence of a further decrease in the temporal trajectory of RTAs following motorway opening was shown in the North control area (−0.029, 95% CI −0.043 to −0.016), but not in Glasgow and surrounding authorities or in the South or East study areas. Table 1b shows that each area had a significant decrease in the number of serious and fatal RTAs during the full study period 1997–2014. However, the time-series analysis showed no significant reduction in serious and fatal RTAs associated with either the construction or the opening of the M74 motorway extension (table 1b). Table 2 presents the pooled number of serious and fatal casualties resulting from an RTA by type of road user and study area, and the percentage change in these, for the 3-year periods 1997–1999 and 2012–2014. It shows that each area experienced substantial decreases in the numbers of casualties in each category (pedestrian, driver or rider and passenger). The reduction in number of pedestrian casualties in the South was tempered relative to Glasgow and surrounding authorities (T=3.25, 95% CI 0.016 to 0.158). There were no differences in proportions between study area for driver or rider and passengers. Numbers of accidents involving cyclists only were too few for analysis. The North study area showed a significant decrease in the temporal trajectory of RTAs following the opening of the M74 motorway. There are two reasons why it is highly unlikely that this was due to the M74 motorway itself. First, no such change was observed in the region as a whole, in the South study area surrounding the M74 motorway extension, or in the East study area containing an existing motorway. If such an observed association were causal, it would most likely have been observed first and most strongly in the area surrounding the new motorway, and second on other major roads in the city that would have experienced a significant change in traffic flow; neither of these effects was apparent. Second, the limited traffic count data available suggested that the M74 extension had little impact on trends in the number of vehicles travelling in the city as a whole. It is important to consider other city-wide programmes which may have influenced RTAs. For example, the North area contained a local transformational regeneration zone which from 2010 implemented new housing, community facilities and improved green space.30 It also benefited from the reopening of a disused railway line, improvements to two cycling and walking paths to the city centre, and the introduction of bus lanes. These may have contributed to the additional decrease in RTAs observed in the North. Over the course of the study period, RTAs declined significantly across all study areas. This corroborates the findings of other UK analyses.1 ,7 We did not find any recent studies that have evaluated the impact of new urban motorways of this kind on the incidence of RTAs. A data summary of evidence showed before and after reduction in RTAs following new motorway construction across Western Europe and North America between 7% and 9%.10 A further North American study evaluating improvements to existing motorway infrastructure (in the form of increasing and widening lanes) showed no impact on the number of RTAs.31 Reviews of a variety of interventions suggest that red light cameras,32 20 mph zones,33 average speed enforcement34 and other types of speed camera,35 graduated driver licensing36 and increasing the visibility of pedestrians and cyclists36 are effective in reducing RTAs. However, none of these was strategically implemented in the area adjacent to the M74 motorway extension, highlighting the possibility of a missed opportunity to augment the motorway construction project with additional interventions that could have further reduced RTAs in the local area. The intervention area saw an attenuated reduction in the number of pedestrian casualties relative to Glasgow and surrounding authorities for the periods 1997–1999 and 2012–2014, not time period specific to the M74 motorway extension opening. We extracted RTA data from the STATS19 portal; although these data are widely used in research,7 ,13 ,28 they have limitations. They do not record all RTAs and rely upon the accuracy of police officers in correctly providing the exact location of the accident.13 Importantly, in the UK, there is no legal obligation to report a traffic collision to the police, and this may lead to an under-reporting of RTAs,1 particularly those resulting in only minor injuries.38 However, it is unlikely that there were any systematic differences in, or changes in, the accuracy of reporting of accidents between study areas during the study period, particularly since a single police force covers the entire area. We compared data from three areas within Glasgow, adjacent to new or existing transport infrastructure, to assess the extent to which any change in the incidence of RTAs might be attributable to the opening of the M74 motorway extension. This did entail certain assumptions in the way the impacts of motorway construction and opening were modelled, but using alternative plausible classifications of intervention effect did not change the overall results. The number of casualties was greater at baseline and postintervention in the South area compared with the East and North areas; the analysis we conducted explored changes in the number of accidents at a landscape level using ANOVA. However, this does highlight a limitation of this kind of natural experiment where it is difficult to define an identical comparator area in terms of road infrastructure, size, sociodemographic characteristics and number of casualties. We made considerable efforts to obtain accurate and reliable traffic count denominator data for the time-series models. Regardless, without traffic count data included in our models, the time-series analysis showed no significant reduction in accidents that could clearly be attributed to the M74 motorway extension. Best available data, published by Transport Scotland in their ‘16 Week After Opening Review’, described increases and decreases of traffic flow on local roads; increases on the main arteries to the motorway and decreases on some local streets. The report stated the M74 motorway extension had satisfied the original objectives of the scheme in terms of its anticipated traffic flow and transferring vehicles from other roads and motorways in the region.39 Importantly, the ARIMA procedure used in our time-series analysis provides a rigorous method for assessing the impact of interventions such as new transport infrastructure on outcomes measured using count data. Our results suggest that policymakers cannot necessarily appeal to a likely reduction in RTAs in justifying the construction of new urban motorway infrastructure. It may be taken for granted that new road infrastructure alone will reduce RTAs, as was argued before the construction of the M74 extension, but we found no evidence that the key strategic and economic development objective to improve road safety and reduce road accidents on local streets had been achieved by 2014. The intervention may have had a number of other important impacts, for example, on air pollution and active travel, but these were not modelled in this paper and are worthy of further investigation in their own right. In addition, accident rates are subject to changes at local level, and although the motorway extension may not have reduced the overall number of RTAs, it remains possible that it may have contributed to changing their spatio-temporal distribution—for example, by shifting the burden of accidents into or out of poorer neighbourhoods. This will be examined in future research. Global urbanisation is proceeding at pace; however, evidence of infrastructure changes is lacking. Our study provides novel and important findings for future developments. Building new urban motorways is controversial, with arguments (including public health arguments) both for and against construction. There is little evidence of the impact of new urban motorway infrastructure on road traffic accidents. The 5-mile M74 motorway extension opened in June 2011 in Glasgow, Scotland, and provided a natural experimental opportunity to evaluate its impact on temporal trends in road traffic accidents. We found no evidence that the motorway extension had altered the already decreasing trajectory in the incidence of road traffic accidents, either during construction or following its opening. Our findings suggest that in planning future investment, it should not be taken for granted that new road infrastructure alone will reduce RTAs in local areas. The M74 study was developed by David Ogilvie, Fiona Crawford, Shona Hilton, David Humphreys, Andrew Jones, Richard Mitchell, Nanette Mutrie, Shannon Sahlqvist and Hilary Thomson, with further contributions from Louise Foley, Amy Nimegeer and Richard Prins. Transport Df. Reported road casualties in Great Britain: main results 2014. London, UK: HMSO.2015.
. Road traffic injury prevention training manual. World Health Organization, 2006.
. The handbook of road safety measures. Emerald Group Publishing, 2009.
. Roads (Scotland) Act 1984; Acquisition of Land (Authorisation Procedure) (Scotland) Act 1947 M74 Special Road (Fullerton Road to West of Kingston Bridge) Orders – Report of Public Local Inquiry Into Objections. Glasgow: The Scottish Government, 2004. Scottish Executive. The M74 completion: Environmental Statement. Edinburgh, Scotland: Scottish Executive, 2003. Transport Df. Reported road casualties in Great Britain: notes, definitions, symbols and conventions. London, UK: Transport Df, 2014.
. Applied time series analysis for the social sciences. CA: Sage Publications Beverly Hills, 1980.
. STL: a seasonal-trend decomposition procedure based on loess. J Off Stat 1990;6:3–73.
. Speed cameras for the prevention of road traffic injuries and deaths. Cochrane Database Syst Rev 2010(11):CD004607.
. Effectiveness of two interventions in preventing traffic accidents: a systematic review. Ann Ig 2014;26:63–75.
. Alcohol-related road traffic accidents before and after the passing of the Road Traffic Safety Act in Croatia. Coll Antropol 2012;36:1483–9. Transport Scotland. M74 completion scheme post -project evaluation study: sixteen weeks after opening review. Glasgow, UK, 2012. Contributors DO led the design of the overall study in collaboration with RM and DKH (and other members of the M74 study team, see acknowledgements). JRO designed and conducted the analysis in collaboration with RM, DFM and DKH. JRO prepared the first draft of the manuscript, with all authors contributing to its main content and revising it with critical comments. All authors have read and approved the manuscript prior to submission. Funding This study was funded by the NIHR Public Health Research programme (project number 11/3005/07: see http://www.nets.nihr.ac.uk/projects/phr/11300507). The views and opinions expressed here are those of the authors and do not necessarily reflect those of the NIHR PHR programme or the Department of Health. The researchers were independent of the funders; the funders had no role in the study design, data collection and analysis, the decision to publish, or the preparation of the manuscript. DO is funded by the Medical Research Council (MRC) (MC_UP_12015/6). Data sharing statement For further information, please refer to the MRC Epidemiology Unit data sharing portal at http://epi-meta.medschl.cam.ac.uk.